Boston Photo Rental carries Profoto and Monolight strobe kits, packs and heads so you can have the perfect lighting for your shoot, wherever you are.In addition to what’s featured on this page, we carry: ProHead extension cables; Profoto speedrings; Air Sync and Air Remote units for the 8a/B1/B2/D and more. 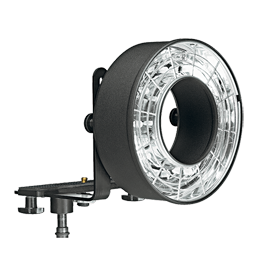 Contact us to reserve strobe equipment today! 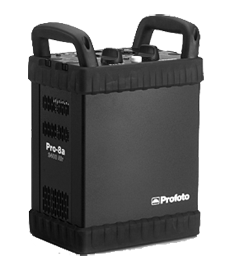 Profoto Pro-10 2400 Lighting Kit Powered by the Profoto Pro-10 2400 power pack with built in Radio Sync and TTL, this is a one-stop solution for photographers who demand more. This lighting kit includes two Proheads, complete with umbrellas and 13' stands. 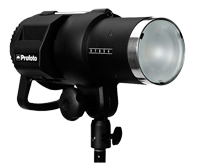 With high-speed flash (1/12.000 s), a recycling time at 2400 Ws of 0.9 s, streamlined power control and unbeatable versatility, the Pro 8A powers a lighting kit includes two Proheads, complete with umbrellas and 13' stands. 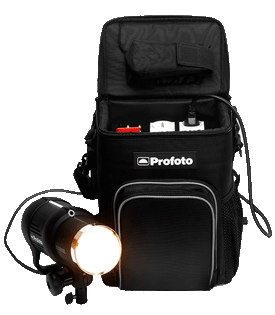 Pro 7A 2400ws Pack Two Head Strobe Lighting Kit The 2400-watt Pro-7a kit gives photographers even control and creativity on demanding shoots of all types. This lighting kit includes two Proheads, complete with umbrellas and 13' stands. The Pro-7a offers action stopping short flash durations and super fast recycling for any type of application, including day after day of demanding fashion shooting sessions. This lighting kit includes two Proheads, complete with umbrellas and 13' stands. The D4 generator is a versatile workhorse, crafted to produce large quantities of high-quality images at an extremely high rate with no variations in power output and color temperature. The D4 has four outputs, each with independent control. In other words, working with one D4 is like working with four separate flash packs. This lighting kit includes two Proheads, complete with umbrellas and 13' stands. Profoto B1 Monohead Kit Our Profoto B1 Monohead kit is ideal for location fashion shoots and other situations where you want to modify and improve upon existing light. 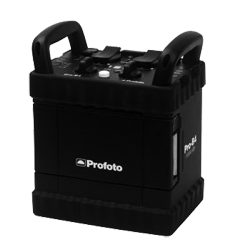 This kit includes 2 batteries and the powerful Profoto B1 monohead. 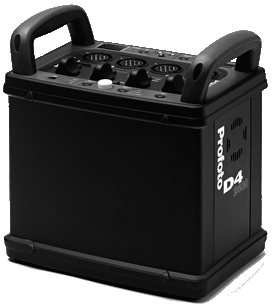 With flash durations down to 1/25,000s, the Pro-B4 offers the shortest flash durations of any generator on the market. It is now possible to freeze motion in a way that yesterday’s photographers could only dream of. At lower power settings it is able to fire up to 30 flashes per second, while the longest wait on full power is less than a second. This kit includes the B4 pack, two charged batteries, two ProHeads, two stands, a PC cord, charger and two umbrellas. 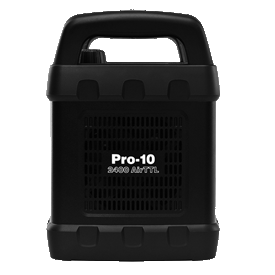 Pro-10 2400w/s With the Pro-10 you can capture and craft the perfect frozen moment with flash durations up to 1/80,000 of a second. That’s not just fast – that’s record breaking for a studio flash. Combined with 2400ws of power and speeds of up to 50 flashes per second, you're sure to create split-second shots that stand out. 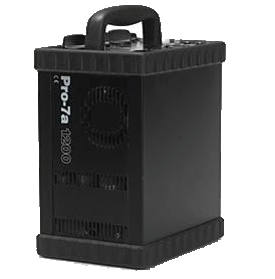 The Profoto Pro-8a Air offers you unmatched performance in terms of flash duration (1/12.000 s), recycling time at 2400 Ws of 0.9 s, power control and versatility. 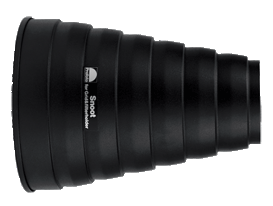 Generate more than 20 flashes per second, and up to 1000 full power flashes per hour, with a flash-to-flash precision of ± 1/50 f-stop at all power settings. 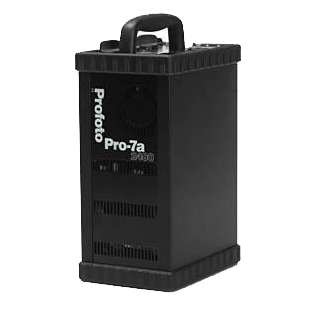 Profoto 7a 1200w/s The Profoto Pro-7a 1200 power pack can take care of many photographers' needs. 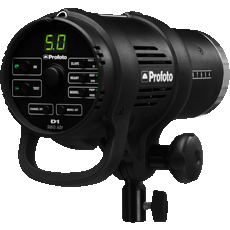 It offers consistent color temperature and exposure level at all power settings as well as a six f-stop range in 1/3 and 1/6 step increments with two easy-to-use dial controls. 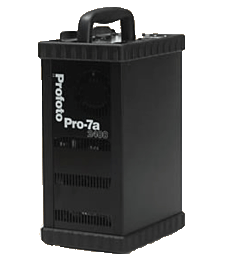 Pro 7a 2400w/s Power Pack The Profoto Pro-7a 2400 power pack features a heavy-duty design, self seeking voltage, consistency of light output and color temperature, and compatibility with a full line of modular light shaping tools. It also has turbo recycling, ultra short flash duration, and choice of asymmetrical or symmetrical power distribution with up to 3 lampheads. D4 2400w/s This relentless yet versatile workhorse is capable of producing very large quantities of images at an extremely high rate. 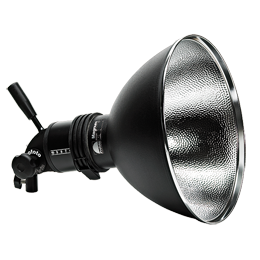 It allows very stable light output and color temperature, which means consistent results, shot after shot after shot. Its four independent outputs, controlled by four individual knobs, allow for both small and large setups with a single generator. Profoto BatPac There is an alternative to a bringing a battery-powered flash to your on-location shoot: bring a mains-powered flash and connect it to the BatPac. The BatPac can also be used to charge other devices, such as chargers, laptops, phones, tablets, wind machines and refrigerator boxes. 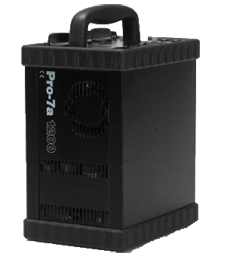 The safe, reliable BatPac can power up to up 300 flashes with 1,000 Ws, 600 flashes with 500 Ws and 1,200 flashes with 250 Ws. 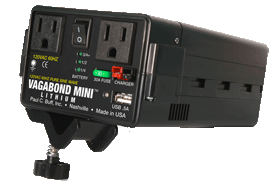 Buff Mini Vagabond Battery Inverter with two Batteries This current-controlled 120VAC portable power source can provide power for up to four flashes. The three-hour rapid charger quickly recharges this small, lightweight unit. Profoto B1 500 AirTTL The Profoto B1 makes it easier than ever to take the flash off your camera. With AirTTL you set the light in a flash. With battery power and a clever design with no cables or cords, you can take the B1 with you wherever you go and put it wherever you want. Add to that the power, speed and light shaping possibilities that Profoto lights are known for, and you have an off-camera flash that makes great light easy. The ProHead Plus is an upgrade of the classic ProHead. For years, the ProHead has been the standard heavy-duty tool in the studio, and it has been so for a reason. It is built in a compact size, yet capable of producing flashes up to 4800 Ws, over and over again, hour after hour. 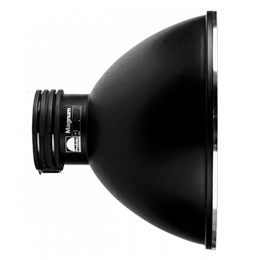 The ProTwin is a single head with two plugs and two flash tubes, offering you unparalleled flexibility when it comes to lighting. Connect both plugs to one generator and halve the flash duration. Connect each plug to separate generators and get twice as much power or twice as fast recycling time. 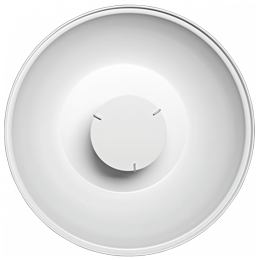 Photographers choose the ProRing Plus when they want a direct and prominent key light without harshness. Some prefer it because it is mounted on the camera and easy to move around with. Others love it because of the unique catch light it creates. Needless to say there is no right or wrong way to use the ProRing Plus. Grids are easy-to-use accessories that limit the light spread. The 10° Grid for the Magnum, the TeleZoom and the NarrowBeam Reflector can be used to shape your key light, create background effects in portraits, or accentuate the highlights in still life photography, among many other things. Not compatible with the NarrowBeam Travel Reflector. 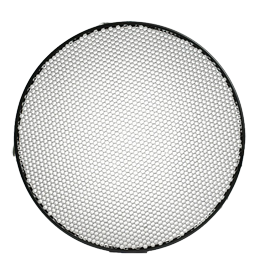 Profoto Beauty Dish 22" w/Sock Photographers often refer to the Softlight Reflector White as the “Beauty Dish.” The reason for this nickname is simple: it offers the perfect combination of even light, crisp definition and contrast. The resulting effect is a pristine, natural look with slightly accentuated shadows that is often ideal for portraits and people photography. Grids are easy-to-use accessories that limit the light spread. 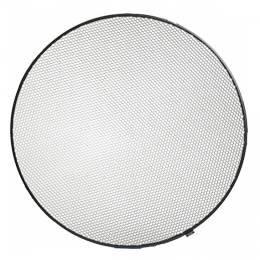 The 25° Grid for the Softlight Reflector White and the Softlight Reflector Silver can be used to shape your key light, create background effects in portraits or accentuate the highlights in still life photography, among many other things. 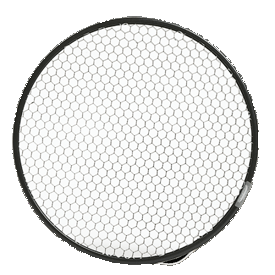 Profoto Snoot with Grid Filter Holder Use a snoot to create striking highlights in your portraits or for product photographs with meticulous details. 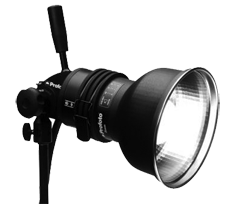 Profoto D1 With a 7 f-stop power range, short flash duration, and diffuser glass on the strobe, the performance of the D1 compares well with many studio packs. And because it’s a compact monolight, it’s also lightweight and all-round. The D1 is a proven, dependable performer that won’t let you down. This kit is designed for the photographer that wants to know they'll be ready for anything. 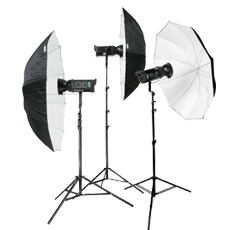 It includes two Travelite 750R monolights, two umbellas, stands and a travel case. Want to make sure that your lighting setup is perfect from the beginning? The Travelite 3 Head kit is perfect for you. 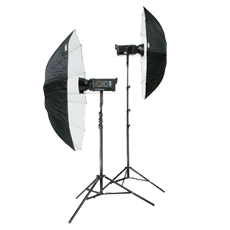 It includes three Travelite 750R monolights, three umbellas, stands and a travel case.